They say the key to true happiness is to like yourself. To some that seems strange, after all, we all like ourselves; don't we? The simple fact is no, many of us put up with ourselves because, well, we're us. Self confidence goes hand in hand with liking ourselves, and far too many find themselves in a situation where their confidence and self esteem takes a battering. The upshot of this is they think they are useless so give up trying. Try to think of an environment where this would happen more than most? Yep, the work place. The problem with a setback at work is everyone knows about it. For example, you go after a promotion and everyone knows you didn't get it when you are back at your desk on Monday morning. Communication in business is vital, but tends to be very impersonal. If you want to give that person a boost then sending this Like Yourself business ecards could be just what they need. 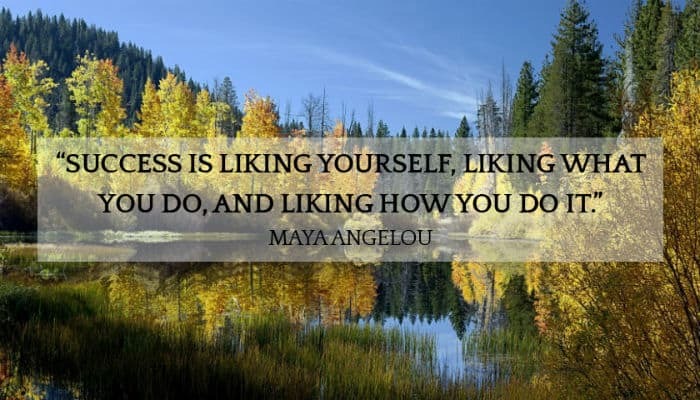 A tranquil scene of a lake surrounded by trees acts as the back drop for these wise words “Success is liking yourself, liking what you do and liking how you do it”. Says it all really..... What kind of Christmas cards does your business send out in December? If you’d like to electronic then check out our corporate Christmas ecards.